One of my first “play” memories is of an old wooden ladder my mom dug up from who knows where and put in the yard for me to discover when I was about three years old. I spent hours and hours playing on that ladder. Although at times it got propped up on rocks or against trees, I remember it best lying on the ground. The challenge of walking one edge like a balance beam, or navigating the length of the ladder by stepping only on the rungs, or even hopping from grassy patch to grassy patch between the rungs kept me occupied for entire afternoons – or at least I imagine it did based on the few scattered memories I have. It wasn’t much, that rickety, old ladder, but it sure made a deep impression. 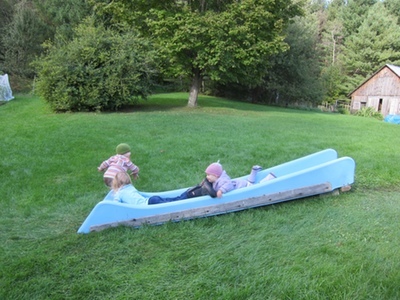 Later, the Mungus (short for Humongous, obviously) reigned as the greatest play structure of all time. As my sister remembers, “it was a series of platforms in the trees with chain bridges connecting them and the whole thing was about 60 feet high”. In reality, the Mungus wasn’t much more than a few wooden platforms – some high, some low – with a large tree that came up through the middle. It had a chain bridge (as in, a walkway made only of chains – not a boardwalk with a token bounce for effect), a rope swing (the kind that swings way out and comes back hard – hard enough to knock the wind out of you if you don’t get out of the way after you jump off), and a tire swing (home of the original super-around-the-world spinny, the memory of which makes adult-me feel queasy, but which kid-me couldn’t get enough of). It was the grade school playground and we never tired of it. It physically challenged even the fifth graders. The school eventually tore it down (probably because it was rotting and kids would occasionally break an arm falling - jumping - off) and replaced it with a generic, plastic-y structure that is only 5 feet tall and has stairs and railings all around. Blah. I miss structures like the Mungus. They don’t exist anymore. And I have to wonder if there really are fewer broken arms now with all the stairs and railings meant to make playgrounds safer. Even if there are fewer broken arms, is it worth depriving children of a structure like the Mungus? Anyway, this is all leading up to a discovery in the barn. Previous owners of our house left all sorts of random junk around the property, most of which we’d just as soon not have (a 75-year-old rusted manure spreader in the woods? ), but every now and again we come across something that we deem a treasure. 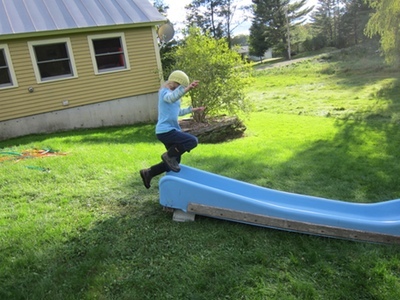 This time, it was a slide that must have been part of a play structure. 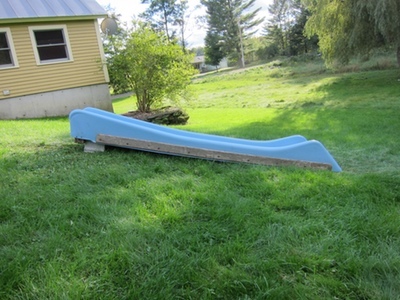 We immediately saw its potential, so Dave lowered it down from the barn attic on a rope and we propped it up on a cinder block on the one slight slope in the yard. Very classy. I know it doesn't look like much, it even looks a bit pathetic considering the Backyard Discovery Playgrounds that are out there. But then again, Dave and I both remember the most magical play from our childhood centering around nothing much– like an old ladder or a rotting platform in the trees. Sure enough, the girls loved it. 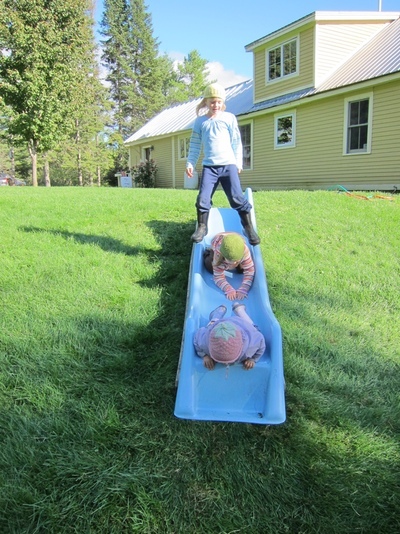 Ideas bursting, they played hard (and rough) on the slide for nearly three hours, only stopping because we made them come in for dinner. Katherine is already planning its transformation into a slip-and-slide on the next “hot” day (poor thing doesn’t seem to realize summer is over), and at bedtime, Clara declared she didn’t want to go to school the next day because she wants to stay home and play on the slide. For nothing much, it is a huge hit. I hope it goes down in their childhood memory as the ladder and Mungus went down in mine.